Ryan Hanigan, hampered with an oblique injury, was sore after taking early batting practice at The Trop, Tuesday afternoon. His rehab and imminent return have been pushed back at least a few more days because of it. Hanigan is now projected to return during the August 4-6 series in Oakland. Topkin also noted the next two games could factor hugely into the Price decision, in terms of the AL East race — the Rays could be within five of Orioles or nine back. 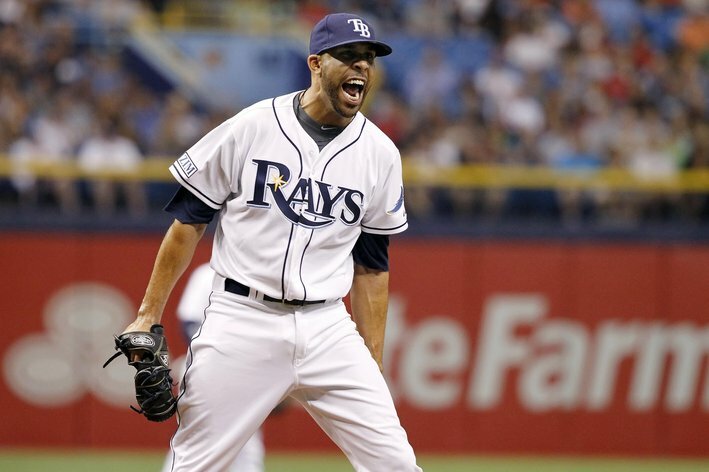 With Price scheduled to start Wednesday, the Rays decision is not likely to be made until the Thursday trade deadline. It should be noted: Alex Colome’s start has been moved to Wednesday at Durham in case he’s needed here, in St. Petersburg. As we mentioned earlier, the Rays designated Erik Bedard for assignment in order to clear roster space for right-hander Joel Peralta, who has been reactivated from the disabled list, the team announced. Per Marc Topkin, the Rays confirmed Peralta had the chikungunya virus. Don’t forget to check out our Rays/Brewers series preview. Ian Malinowski of DRaysBay penned the piece below, and I felt that it was important enough to repost on X-Rays Spex. The Rays enter the week of the trading deadline with one of the more interesting decisions they’ve faced. They can either sell, David Price, Ben Zobrist, and/or Matt Joyce, all three of whom are desirable players with one year after this one remaining of team control, or, they can keep their veterans and perhaps even add small pieces to help in a playoff run. The FanGraphs playoff odds (which include projections of team strength) currently give the Rays a 13% chance of making the playoffs. That could either go up or down by Thursday. For this thought experiment, I will assume that the decision to trade Price, Zobrist, and/or Joyce has no bearing on the Rays’ ability to resign them in 2016. For Price, the chance that happens is near-nonexistent. For the other two it is merely unlikely. The dominant force of the the trade-deadline market is the difference between the marginal values of a win for different teams. Vince Gennaro laid out the structure of the system in his iconic book, Diamond Dollars: The Economics of Winning in Baseball. If you haven’t read the book, though, don’t worry. Back in 2007, The Hardball Times published a series of articles by Gennaro, laying out the same ideas. You can read them all here. The money totals are out of date (the average cost of a win on the free-market is now around $7 million), but the overall system has changed little. The basic idea is that every game that a baseball team wins makes them additional money, but this doesn’t happen at a constant rate. A team’s 71 win and or their 101th win might make them only an additional $4 million over what a 70 or 100 win team would make, while their 88th win makes makes them $9 million over an 87 win team would make. The amounts and the slope of the curve is different for every team and depends on the details of their market place, but the basic idea of the win curve APPLIES to every one. Of special interest is the playoffs. Making the playoffs provides a large monetary boost for teams, both through playoff ticket sales and through future season tickets sales. Therefore, the value of the win that puts a team into the playoffs is dramatically more than the value of the win previous. It’s this imbalance that drives deadline deals. When a player’s production is worth more to a potential buyer than it is to a potential seller at this moment, then a deal sending current wins one direction and future wins in the other is more likely to get done. Note that small-market teams like the Rays both make less money in total, and make relatively less money through the playoffs than do large-market teams, so the Rays are always under some incentive to sell current wins. It’s not a fair system, but it’s what we’ve got. 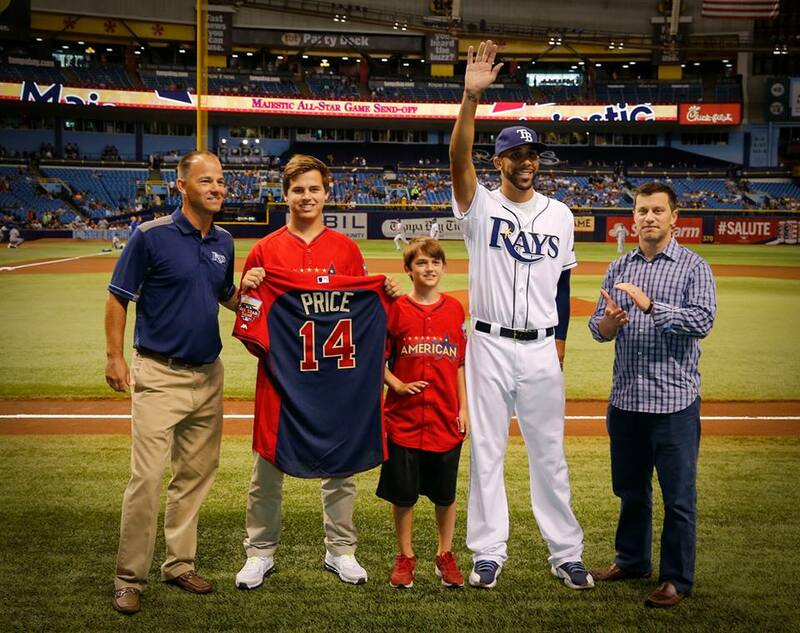 It’s a given that David Price will be traded at some point before his contract runs out. The only question is when. By the FanGraphs projections, Price has about 1.5 wins above replacement level to offer his team over the rest of the season. Ben Zobrist has 1.7 wins to offer, and Matt Joyce has .8 wins to offer (Matt Joyce’s is more variable than the other two, based on how he is used). I figure that the Rays replacements for Price and Zobrist are pretty close to replacement level, while their replacements for Matt Joyce are somewhat better. This means that all together, those three are a win swing of perhaps three wins. That’s enough to take the Rays — who are already on the edge — firmly out of playoff contention. Even missing the playoffs, those wins are already on a fairly fat part of the curve. I’m fairly certain that to the Rays, those wins are now worth at least the average value of a win, or $7 million. Those same wins would be worth more to teams like the Mariners, who are both a larger market team and who currently have a 20% chance of making the playoffs. Let’s guess that those three wins are worth $10 million each to Seattle. This offseason, Michael Valancius did some work on figuring out the dollar value of prospects. He found that a $21 million value is roughly the equivalent of a Baseball America ranked 41-100 prospect. A $30 million value is a 16-41 ranked prospect. So, for those three together, the Mariners would now be willing to give up Taijuwan Walker (preseason #11 ranked prospect, whose stock has fallen a bit since then) plus the same package they would give for those three players’ 2015 production (Note: this is just an exercise, all three would not likely go to the same team). So, the difference between trading now, as opposed to trading during the offseason is basically one flawed but potential ace pitcher. Andrew Friedman must weigh that against the value of a potential playoff run. If, in this week, the value of those three players to the Rays goes down (as the chance of a playoff run goes down), he will probably sell. If the value goes up, he will probably not sell. My numbers may be inaccurate, but this is the structure of AF’s decision. Now, assume for a second that it is Thursday and the Rays have swept the Brewers. Their chance of making the playoffs has gone up, and the value of Price, Zobrist, and Joyce this season evens with the value of those three to potential buyers. Friedman keeps them all. It’s a major GAMBLE that will only pay off if the Rays stay on the fat portion of the win curve. Major moves are unlikely, but after Jake McGee and Brad Boxberger, the entire Rays bullpen can potentially be improved upon. And while those improvements will be small, a they can do important work by maximizing the returns from the investments already made in this Rays team. Luckily for Friedman, the deadline for improving the bullpen with low-risk moves is not Thursday. After Thursday, players can still be traded but they must first be passed through waivers. As a team on the back end of playoff contention, the Rays are in a perfect spot to make waiver claims for any relievers that become available. In the past, potential impact arms such as Jesse Crain (who did not recover from injury) and Chad Bradford were acquired this way for nearly nothing. That type of player will be on the wishlist once again, and while they will be worthless to the teams selling them, they will be worth a little bit to the Rays, and that valuation difference makes the trade possible. It’s the same interaction as the non-waiver trades writ small. Either way, this upcoming series could go a long way toward deciding the immediate future of two of the best players in Rays history. 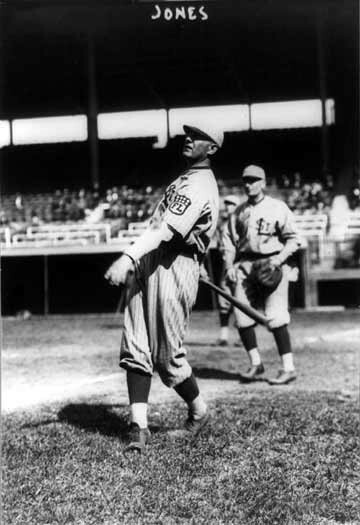 Photograph shows Fielder Allison Jones, baseball player for the St. Louis Terriers facing left, in uniform, swinging bat. The photo dates to 1914. 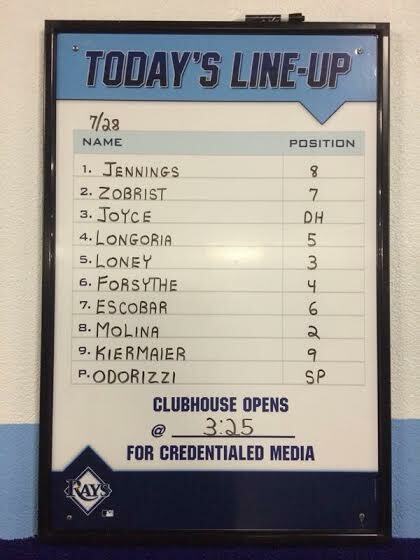 Jake Odorizzi is batting eighth tonight. Maddon did something similar last year with Jeremy Hellickson, and earlier this year with Cesar Ramos. The Rays are trying to become the fourth team to get to .500 after being 18 games under. Others: 1899 Louisville Colonels, 2004 Devil Rays, 2006 Marlins. Hellickson is expected to rejoin the rotation this weekend, but it won’t be Friday. David Price is listed as the starter that night, though the rest of series is TBA. The Rays have placed RHP Joel Peralta (illness) on the 15-day DL, retroactive to July 13. LHP Jeff Beliveau has been recalled for the fifth time this season and will take Peralta’s place in the bullpen. Don’t forget, you can read about the upcoming series in our Rays vs. Cardinals series preview. C Ryan Hanigan has been placed on the 15-day DL with a strained oblique (retroactive to July 9); the Rays have corresponded by recalling Curt Casali from Triple-A Durham. Tampa Bay also moved Wil Myers to the 60-day DL — clearing room on the 40-man roster. Myers will be eligible for re-activation on July 30, though he was expecting to return in mid-August anyway. Per Marc Topkin, Casali provides the potential for much more offense than Ali Solis, who was up earlier when Hanigan was hurt. 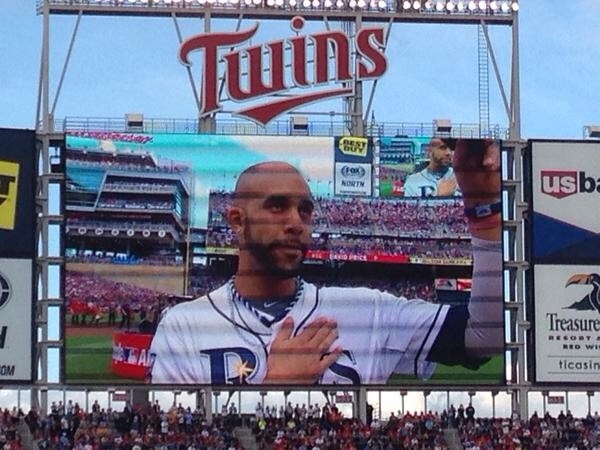 Class act, that David Price! When his name was announced prior to Tuesday’s Midseason Classic, David Price tipped his hat then touched the Zim patch on his jersey — a nod to the late Don Zimmer. 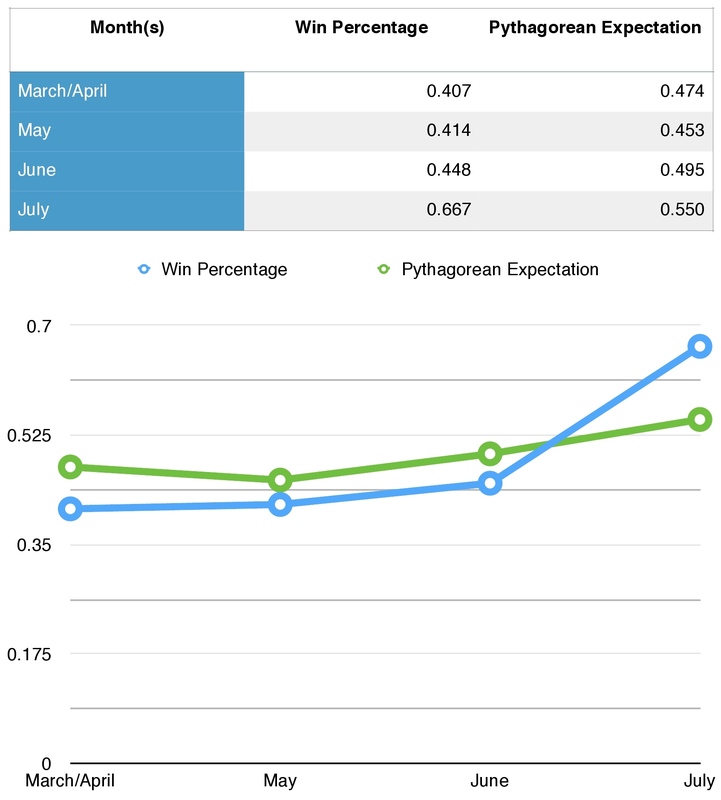 At 44-53 (.454 WP) overall, the Rays are finally catching up with their overall Pythagorean Expectation (46-51, .474). In fact, the Rays’ winning percentage has significantly increased from the middle of June until now. To put it another way, from the middle of June until Sunday, July 13, the Rays have significantly exceeded the expectation — as it relates to runs scored vs. runs allowed. The question begs: Can they keep it up throughout the (symbolic) second half of the season? In “No, really? !” news, former Rays DH Luke Scott was fired from his Korean team following a confrontation with the coach. I cannot help but ask, what took so long? Just one more day until our next watch party. 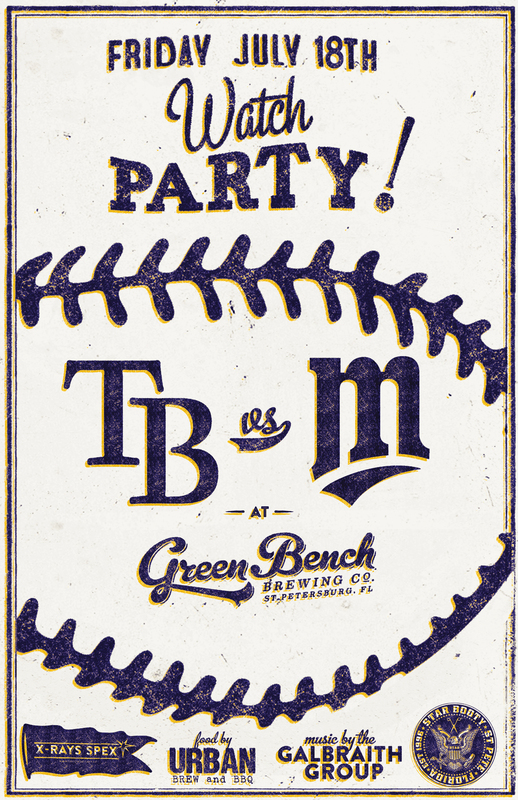 Spread the word, people — we want to pack Green Bench Brewing Company!